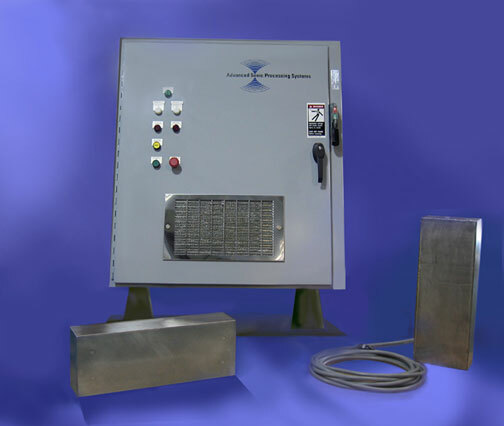 Our Ultrasonic Immersibles provide the ability to acoustically energize existing tanks and treatment vessels. This technique offers the convenience of a quick ultrasonic installation into your current process loop without major equipment alterations. The permanent acoustic output performance of our Ultrasonic Immersibles is the envy of worldwide ultrasonic equipment manufacturers. Our Immersibles deliver constant and consistent operational performance, year-after-year. Our solid state transducers and silver-brazed bonds are guaranteed to deliver unmatched process reliability for 10 Years. the transducer's mounted surface, (17" x 7"). for immersion into your existing processing vessel. 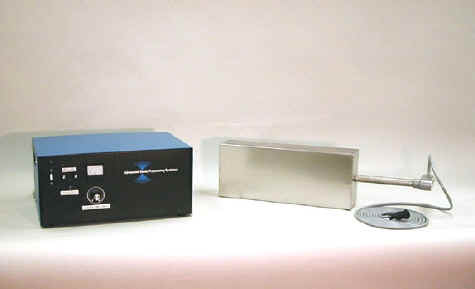 Single frequency Immersibles may be mounted to direct the ultrasonic sound field toward the material requiring treatment. The Immersible's lower mounting bracket could be a saddle to eliminate the need for lower internal tank access. The Immersible's conduit may be formed for positioning the transducers on the tank's bottom surface. Material may be lowered from above or conveyed through the ultrasonic sound field. Strategic liquid level depths will strongly influence the processing characteristics of the material positioned within the sound field. Our Dual-Frequency Ultrasonic Immersible Systems. Our Dual-Frequency Technology may be packaged into a simple Immersible system. The opposing diaphragm plate configuration maximizes the reaction kinetics within the processing chamber. This arrangement may be used for batch or continuous treatment dependent upon material flow characteristics. 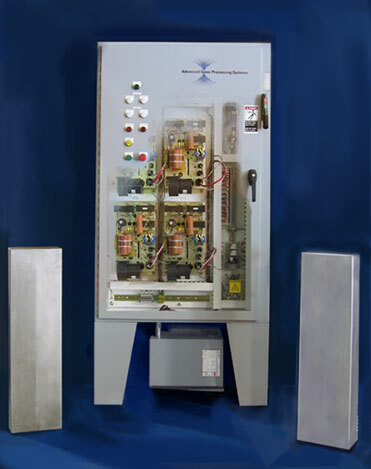 We offer many additional Dual-Frequency configurations to adapt to your particular installation requirements. The Dual-Frequency Immersible Trough is a continuous flow system. The material flows through the center section for effective acoustic exposure. Transducers may be attached to the bottom surface for thorough treatment of high density material. Our Ultrasonic Trough provides an effective structure for this purpose. The basic Immersible System includes a Diaphragm Plate sealed Transducer Cover ultrasonic power cable conduit, and the high-frequency electrical generator. To purchase an Ultrasonic Immersible, please specify: The Diaphragm Plate size and power level; Transducer Style; Mounting Tab style and location; and the Conduit Configuration bent to satisfy your installation requirements. Side Mounted Immersibles with various mounting tab arrangements. The Side Mounted Immersible is also available with a rear entry transducer cable connection. The Rear Entry Conduit connection allows Side Mounted Immersibles to be stacked vertically for tall processing tank installations. Positioning rails allow each Immersible to slide down tracks attached to the inside wall of the processing tank. Bottom Mounted Immersibles with a reversed bend or gooseneck conduit. We also offer a Bottom Mounted Curved Diaphragm Plate Immersible. The Curved Diaphragm Plate Immersible allows the settling sediment to vibrate off the resonating surface. This configuration eliminates the gradual decay in ultrasonic performance caused by accumulating debris which isolates the diaphragm plate from the process solution. Top Mounted Curved Diaphragm Plate Immersible. The Top Mounted Curved Diaphragm Plate Immersible is built to project the sound field downward. The curved surface allows rising coalesced gas bubbles to slide off the vibrating diaphragm plate. Trapped gas/vapor bubbles will prevent the ultrasonic energy from coupling to the process solution and will reduce processing results. The Curved Diaphragm Plate Immersible prevents vapor pocket trapping thereby improving system performance. The flexible Braided Stainless Steel Conduit is ideal for installations requiring complex immersible conduit geometry. The flexible conduit assembly is easily maneuvered around obstacles, simplifying the initial installation. The Bulkhead Fitting Ultrasonic Immersible eliminates the need for the conduit by passing the transducer power cable through a hole in the wall of the process tank. The bulkhead fitting is equipped with an "O" Ring to seal this penetration for leak tight operation. The bulkhead fitting is easily serviced for "O" ring maintenance and replacement. Immersibles provide a large acoustically activated surface for maximizing contact area with the process solution, (the stiff paddle effect versus point source resonators). Immersibles are easy to install and maintain. Existing storage tanks can easily be converted into an ultrasonically activated vessel/system. In addition, troughs or other material conveyancing hardware can be ultrasonically activated for effective treatment while the product moves to the next location. The primary source of sound energy is emitted from the Ultrasonic Diaphragm Plate. The high peak-to-peak displacement of the Diaphragm Plate creates the maximum cavitational intensity directly in front of this surface. The installation flexibility of the Immersible allows the hardware to be transferred from vessel to vessel. Temporary setups are easily moved and reconnected to accommodate expanding systems.